We will meet for lunch at La Guinguette, a riverside restaurant in Montflours. After lunch, we will make our way to the Museum of Vintage Motor Vehicles, situated a short walk (or drive) from the restaurant. A brief description but please use the link above to an article about it. A little lost in the depths of the Mayenne lives an eccentric character. He defines himself as a simple enthusiast of old motorcycles. 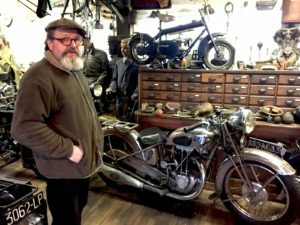 But above all, he is the creator of one of the most beautiful motorcycle collections in the world that truly tells the story of motorized two-wheelers. 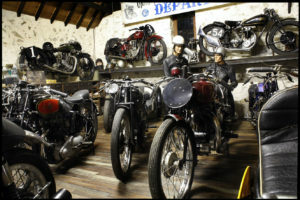 On his farm in Montflours, Mayennais Jean-Luc Gaignard has spent forty years of his life finding motorcycles and vintage cars and other memorabilia, even mannequins. A historical treasure that caught the eye of American actor Brad Pitt, who visited in 2016.